Heat oven to 400°F. Place paper baking cup in each of 12 regular-size muffin cups. In medium bowl, stir muffin mix, pie filling and egg until blended (batter will be very moist). Divide batter among muffin cups. Bake 28 to 30 minutes or until tops spring back when touched. Cool 5 minutes; carefully remove from pan to cooling rack. Cool completely, about 30 minutes. 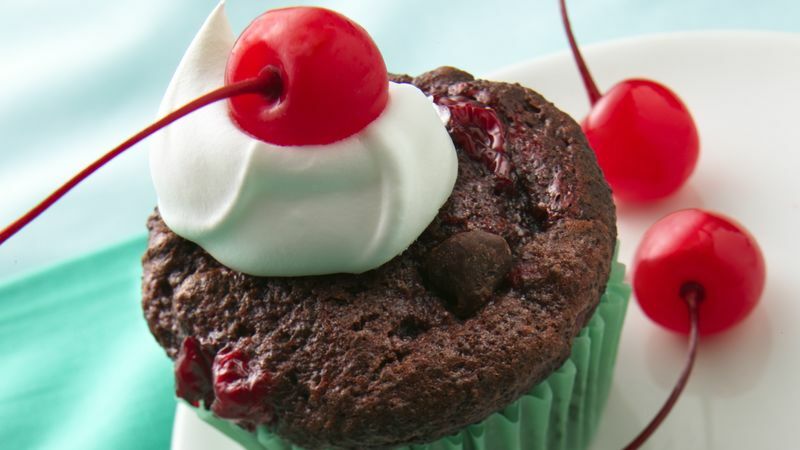 Serve each cake topped with dollop of whipped topping and a cherry. Black Forest is the area in Germany where chocolate cake and cherries were first combined in the classic Black Forest dessert.